holding this book in my hands, on an almost spring afternoon out in my yard, i was moved to the edge of breathlessness. 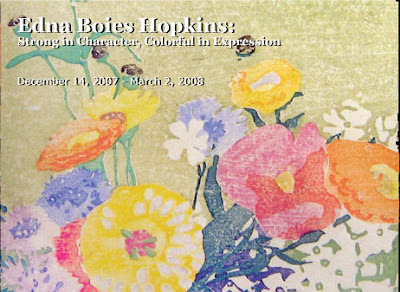 not only is there a complete catalogue of edna boies hopkins' wondrous prints, beautifully reproduced, but in addition a truly relevent and meaningful narraitive. too often, as you've heard me complain, the japanese roots of the work we see is ignored. here it is covered comprehensively, and carefully. chronicled are boies's studies with arthur wesley dow, and dow's involvement with japanese prints is discussed intelligently. VERY numerous and various have been the vicissitudes of the wood-cut. Now in the enjoyment of a wide and flagrant popularity, now in the brief shadow of a passing disfavour to-day, its facile possibilities are more than ever appreciated. The colour- prints of Mrs. Edna Boies Hopkins, described in this article — as will be seen from the examples given — are of an exceedingly interesting nature. Some few years ago when teaching at the Veltin School, New York, and under the stimulus of the talented principal, Mrs. Sprague-Smith, Mrs. Hopkins discovered the need of flower studies which should have something of the simple charm and direct appeal of the flowers themselves. Such studies apparently were not to be found — they were therefore to be attempted. 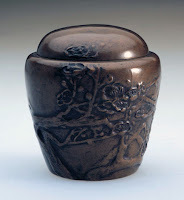 It seemed to Mrs. Hopkins, who had been for some years a student of Japanese art, that the methods of the wood-engravers of Japan was the one most suitable ; and a visit to Japan and practical experience of those methods confirmed this opinion. Setting aside the considerable mass of experimental work — in* itself no slight achievement—the series of ten flower studies, of which the four reproductions here given are typical, was Mrs. Hopkins' first work in this manner. It will be noted that the motif is generally quite simple — a spray of leaf and blossom — but so disposed as to suggest at first sight the whole character and habit of the plant. 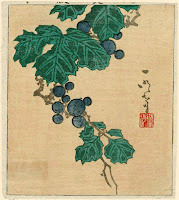 To give this realism, so utterly given in the delightful flower studies of Keibun, Yasukuni and Utamaro, Mrs. Hopkins has followed largely the technique and manner of the great Japanese artists. The tools used are the half-dozen dainty little knife-chisels used by the Japanese engravers, the wood is cherry cut grain lengthwise, the brushes also are Japanese except one strange tool which is used for broad surfaces and bears an uncanny resemblance to a tooth-brush. The prints themselves which are on fairly stout Japanese paper are taken off the blocks by rubbing with the sensitive bamboo-covered tampon — a separate block being used for each colour in addition in some rare cases to an outline key block. The register is the simple but effective Japanese method. No two prints are alike, the slightest variation in the printing giving an individuality to each impression. Indeed, one of the great charms of the process is the element of surprise in each print as it is taken off. That Mrs. Hopkins has seized the individuality of her subjects is apparent at a glance, but the manner of treatment has contributed much to the success gained. For instance, in the large green leaves of the convolvulus (or to give it its charming trivial name in America — Morning Glory), the long vertical grain of the wood gives a most happy effect. This plate is printed without back-ground and is an excellent example of simple and frank treatment. Perhaps the most successful print — it is indeed quite a master-piece in its own manner — is the rendering of the Phlox, in which a wonderfully complete effect is gained by reserved and subtle artistry. The great value of repression could hardly be better proven than in this extremely sensitive print, the white mass of the flowers standing out most convincingly against the dull silken sheen of the back-ground. The prints of the bramble and the fuchsia are, each in its own way, natural and entirely decorative ; and are less interesting than the others in subject rather than in treatment. The "Petunia" print which Mrs. Hopkins has designed expressly for "The Bibliophile," though necessarily of a much smaller and simpler type than the other examples illustrated, has, nevertheless, in the decorative massing of the leafage and the clever suggestion of the flower's flaccid limpness some of the distinguishing qualities of the larger studies. Of each of the larger flower studies so far dealt with there have been printed fifty examples, and no more will be done. Mrs. Hopkins in designing the subjects, cutting the blocks, and pulling the proofs, is entirely responsible for the prints. A second series of ten flowers has now been made, and it is the intention of Mrs. Hopkins to next produce a complete series of studies of the various fruit-tree blossoms, such as the plum, cherry and apple. after this piece was written, hopkins' work evolved, of course. 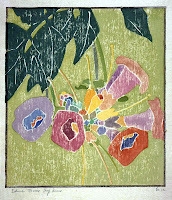 the trumpet flower image here is an example of her more art deco style. sadly, many repositories of her work online come up with 'not yet digitalized.' much hope hangs on that 'yet.' happily though there is now a beautifully published record of her work. you have a few weeks left to see the show (see sidebar); and you have a little time too to hold it in your hands. Superb post. I love to visit your dazzling world, Japonisme. oh thank you, princess. my dazzling world is so happy when you visit. Because of your mentioning this artist, my friends and I went to the Columbus Museum of Art and saw her wonderful prints. Thank you. oh my jana--that's wonderful. thank you so much for telling me. What a great site. Poetry of words and color prints! A superb selection I can look time and again to strenghen my thirst for continued collecting of prints by artists such as Baumann, Hopkins, Phillips, Yoshida not to mentioned the likes of Lautrec and Steinlen. Keep it up! "ahhh," she said, a tinge of envy in her voice, "what a wonderful idea." courtesan sidebar part b: Salomé-mania!